Also, to me, Spring makes me think Easter dinner, Easter egg decorating and hunting, garden prep, and mucho outdoor time with nice, mild weather. All great things! Speaking of Easter, you may remember that at Christmas time, Matt and I decided to start having holiday dinners at our place. Family members brought over different side dishes (some even do main courses – thank you for making me look like a great hostess! lol), and I made some side dishes and cupcakes. We had such a good time with that, that we decided to do Easter dinner here this year, too. The first thing that came to mind is more seating. We have always made do and just added extra folding chairs, extra folding tables, etc. But this year, we wanted to have a nice, sizable table that could seat more people. As it is, whenever G, as the kids call her (my mom), comes over, we are already have to hunt for extra chairs as our table had four chairs and was on the small side. Anyway, I had about ten minutes of actual searching time into the table when I gave up. Matt is just a much better CL-searcher. I knew he’d find one that was perfect. 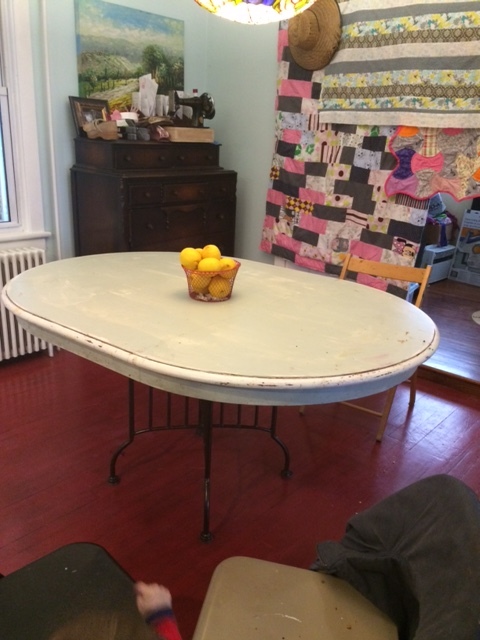 As usual, he delivered and found this perfectly-sized table for our needs. It’s seven feet long and very narrow. Just what we were looking for. It came with six chairs, which is an upgrade from what we had. We’ll still need folding chairs when we have extra guests, but not for permanent use! Yeah! So both Matt and I loved the table. He was okay with the chairs, and I thought the colors weren’t “refined” enough to match the rest of the house. He agreed to paint them this awesome shade of jade-black that we used for the vent hood in the kitchen. (I have a thing for black paint and natural wood these days.) Unfortunately, even though he sanded the heck out of the chairs, the two that he painted started to chip quickly under our two-year-old toddler mutant ninja turtle’s use. Bummer. But as the resilient craft-addict that I am, I decided to not let the chair make-over get me down. I had to move on and shift my focus. 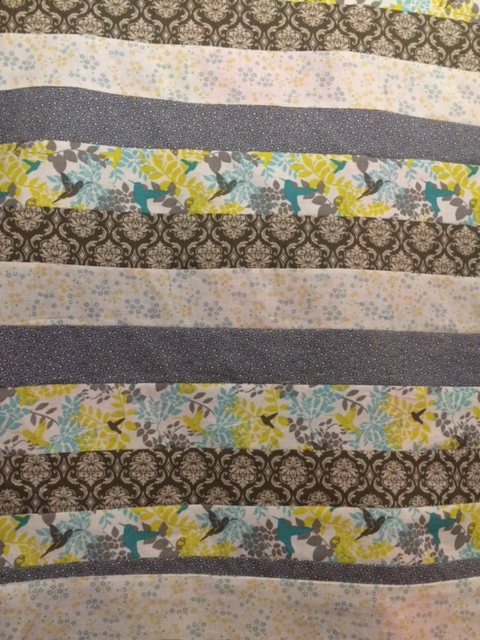 I quickly found something else to daydream about – a quilted springtime centerpiece for Easter dinner. 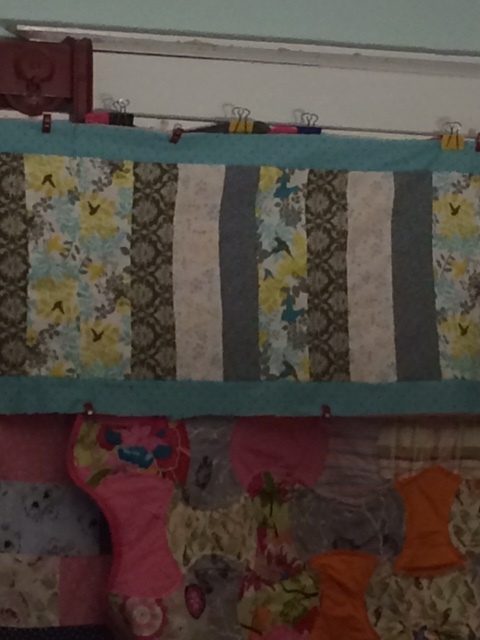 I am very new to quilting and thought that it would be a fabulous idea to make a table-runner. And then comes the same issue I always have — where will I find the time?! I liked that it’s not too “Easter-y” and that the colors go nicely with the rest of what’s going on in the house. In other Spring news, I was jazzed to see temperatures in the 50’s mentioned in our local forecast. It’s a shame they don’t tell you that it will only be that number for about 12 minutes of the day! No matter the temperature, I was determined to get out and turn the soil over in the garden this past weekend. The kids and I went out and did the turning by hand and with shovels. The soil was rich and black and full of earth worms. Perfect! And then I saw something I never saw last year — grubs. Boo! These nasty little guys eat the roots of your veggies, which is not cool. And we have an infestation. They are just everywhere. So I researched what I could do without using chemicals, and saw some pretty good reviews about Milky Spore and nematodes . I called my local nursery and decided to get the Milky Spore based on their feedback. I’m hoping it will work well and not have too much impact on our harvest this year. As I always do, I changed focus after I found out about the grubs. A.S. grabbed something special while we picked up the Milky Spore, and we came home and did some indoor springtime gardening instead. 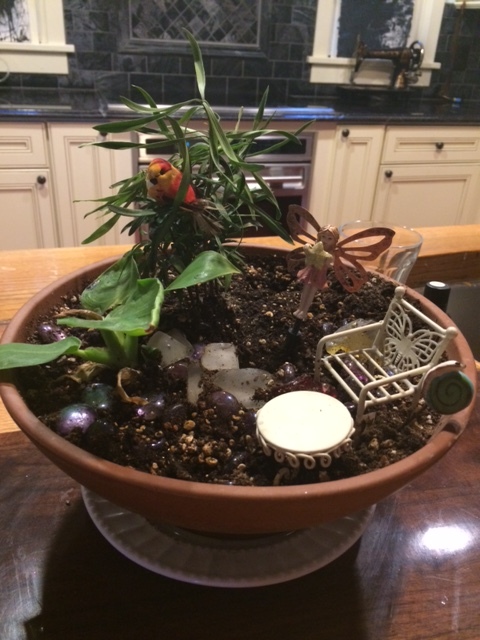 Thank you, again, friends, for this awesome fairy garden starter kit! I’m being called by the TMNT (first T is for toddler, remember?) for morning snuggles, so it’s time to sign off for me. Wishing for springtime weather and family time for all of us this coming holiday! < Previous So You’ve Got Yourself a 66?! Haha! Me too. We missed you yesterday. Just checking into see if you’ll be attending the spring session? 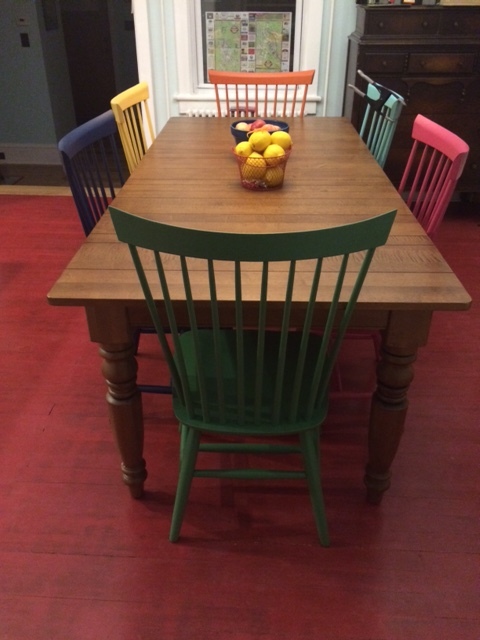 Love the dining room table- I sorta like the multi colored chairs! You should have had Matt make a dinosaur table to match AW’s bed though. (then again, maybe not, as my kids would want to come to your house for every meal…haha!) We head down the shore tomorrow through Sunday, but let’s make plans soon! Happy Easter to all, esp. Moose!